Despite the mental weakness of Franz’s son Ferdinand, Metternich supported his accession, perhaps also convinced that this young man, perceived by the Archduke John as ‘wholly incapable of decisive action’, would allow Metternich to run the affairs of state with the minimum of interference. Indeed, Metternich proceeded to personify the system that now governed most of Central and Eastern Europe far more than the Emperor. The ‘tyranny’ that was reported to have descended on the Empire was much exaggerated by liberal opinion, especially in England. The remarkable memoirs of The Times correspondent of the day, Charles Pridham, describe vividly how the machinery of a police state was mobilised to watch and monitor his every move as he attempted to get to Hungary to cover events there. From Vienna to Trieste he was treated to every conceivable measure of surveillance and official delay, worthy indeed of the wiles of the Eastern European communists in their dealings with correspondents a hundred and forty years later. But for the help of the British Consul in Trieste, who certainly defied the instructions of his Ambassador in Vienna, the supine and ‘pragmatic’ Ponsonby, he would almost certainly never have made it into Hungary at all. But though a price was eventually placed on his head by the infamously severe General Haynau, Pridham suffered no physical violence and it was somehow typical of the Metternich era that, despite the furious cries of journalists and writers against the reign of censorship and confiscation, none was ever imprisoned or physically attacked for attempting to subvert the rules. There were no ‘show trials’. No records of torture during the Metternich period, of individuals disappearing or of incarceration without due process of law, exist. Because the revolutionary events of 1848 affected the structure of the army directly, they also threatened the existence of the dynasty. Conditions in Vienna and Budapest suggested strongly that the fiction of the Emperor Ferdinand’s reign be abandoned. The generals who were loyal to the dynasty awaited orders from Vienna but from the Emperor there came nothing. When Ferdinand went for a carriage ride, against the advice of his courtiers, and saw the angry Viennese crowd jeering, he mistook it for innocent emotional excess. ‘Ma Liebe Wärner! Schauens die oan! So a Stuam!’ (‘My darling Viennese! Just look at them. How excited they get’), he observed in broad Viennese dialect, utterly unperturbed. On another occasion when following a riot a stray cow found its way into the Hofburg courtyards, he looked down from a window languidly commenting to his horrified aides: ‘That must be the first stupid cow to get into this palace without the help of any nepotism’ (‘ohne Protection’). Fortunately for the dynasty, the moment brought forth the men. Three distinguished soldiers emerged who, keeping their nerve, would ensure the survival of the House of Austria. When the Emperor said Wir (We), cynics joked that each letter stood for one of his generals. Chief among these was a man in his 83rd year whom we have already encountered on the battlefields of Europe a generation earlier: Field Marshal Johann Josef Wenzel, Count Radetzky von Radec. As we have observed, there was nothing in Radetzky’s career to suggest that he would for a moment either surrender or give up the struggle for the Habsburgs. His greatest support was his popularity among his soldiers but also – and this is rarely referred to – among the Italian peasantry. These saw him as a guardian against the pretensions of their Italian aristocratic landlords and the intellectual musings of the Milanese middle classes whose ambitions carried no weight among the simple ‘contadini’; a class division repeated throughout the monarchy. Documents found recently in the USA indicate that Radetzky was not the simple reactionary that he is sometimes painted. As a young man he had embraced the Enlightenment ideals of the Josephinian era and had been one of the first young officers of the Imperial army to join a Masonic lodge. A strong conviction that progress was to be welcomed never left Radetzky. His support for those less fortunate than himself assisted many military careers, notably Benedek’s. At the same time his human frailties endeared him to his Italian soldiers who knew the rumours (perfectly true) of his many illegitimate children and of his long, passionate and affectionate affair with his Italian housekeeper, Giudita Meregalli, who was equally devoted to him. Such a lifestyle was expensive and it was Radetzky’s tragedy to be married to a wife who sought refuge from her husband’s many infidelities in the relentless pursuit of material and costly luxuries. In 1798, he had married the rather stiff Friulan Countess Strassoldo. In eighteen years she had dutifully borne him eight children and, from 1805, two-thirds of every florin Radetzky earned were sent straight to Gorizia for his wife and family’s needs, 4,000 out of 6,000 florins, according to one letter from Radetzky to his favourite daughter, Friederike Wenckheim. In 1816, the General only staved off bankruptcy by pledging his debtors half of his future income. Even when he was made a Field Marshal in 1836, the financial worries did not cease. In addition to his eight children with Countess Strassoldo, only two of whom would outlive him, the general had commitments with his Italian Signora Meregalli. She was a voluptuous, capable woman whose simplicity, warmth and charm were all any soldier could wish for. Milanese history has embroidered her character with many details but all the contemporary sources are agreed that she was a formidable cook. She had ‘conquered’ the old general with, among other gifts, her ravishing culinary skills, not least her gnocchi di zucca and cotoletta alla Milanese, a dish later exported to Vienna where it became the ubiquitous Wiener Schnitzel. For Radetzky, Signora Meregalli was also a vital source of information on what the Italians were thinking. Her connections with the leaders of the Lombard rebels have never been proven, though they are alluded to in Italian texts. In any event, as Radetzky’s letters of March 1848 show, he knew the explosion was coming; that Piedmont was rearming and that all the warning signs were there. These warnings he conscientiously passed on to Vienna but his superiors filed them unread, being distracted by events nearer to home. The Italians needed little encouragement to rise up. The Milanese intellectuals, excited by Piedmontese and British propaganda, seized weapons and began to menace the garrison. Confronted by an armed uprising, Radetzky knew he had to move swiftly. After five days of attacks he brought his forces out of Milan. The Imperial troops marched out of the city on a wet and windy night. The cannons roared and the clatter of rifle fire filled the night, illuminated as it was by the flames of the burning buildings. As Radetzky’s advance guard punched a hole through the thin revolutionary forces holding the Porta Romana, the troops marched along the Lodi road past the motionless figure of their commander, who was watching with his small staff on horseback in the torrential rain of a thunderstorm. The rain poured off his hat and coat and, though drenched to the skin, the Field Marshal, motionless and calm, watched his men. Finally when almost the last soldiers had passed, Radetzky was heard to say ‘Wir kehren wieder’ (‘We’ll be back’) before riding off into the rainy night. 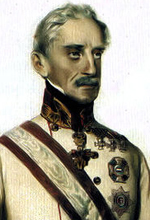 As Radetzky retired into the formidable ‘Quadrilateral’ of fortresses: Verona, Mantua, Legnano and Peschiera, the only good news seemed to come from Tyrol, where the aged priest and veteran of 1809 Haspinger and the grandsons of Andreas Hofer had marched towards Mantua to avenge their grandfather’s death. Haspinger’s beard was now no longer red but silver white. The fortifications Radetzky found on regaining the Quadrilateral were in a parlous state. In Verona some outworks were held only by three or four men. In Peschiera there was a garrison of fewer than 41 men, of whom 17 were officially classed as invalids. But the old Marshal was undeterred. From here he tore up the Italian peace overtures and made preparations to destroy his opponents. He had trained his troops over the previous years and he knew their quality. As early as 1833, he had written a paper for the Archduke John on the possibilities of defensive campaigning with Verona rather than the Mincio river as the key to his strategy. The experienced soldier knew every inch of the territory and he had fought many campaigns against far more deadly foes. While Radetzky prepared his counter-offensive, two other Habsburg generals moved to support the throne. 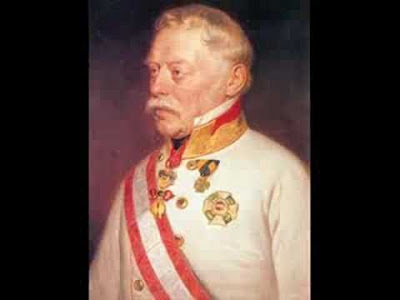 The first of these was Prince Windischgrätz, a general very much of the reactionary school with a heavy, brutal face while the second was, perhaps, the most romantic of all Austrian generals of the mid-nineteenth century, the Croat, Josef Jellačić von Buzim. Together with Radetzky, the three made up with the initials of their surnames the Imperial and Royal WIR (the I and J were interchangeable). If the Kaiser used the royal We (Wir), he meant Windischgrätz, Jellačić, Radetzky – his three generals. It was Windischgrätz who subdued Prague and then came back to deal with Vienna. The experience in Prague had hardened him even more. A few yards from the famous ‘Powder Tower’, he had seen his wife shot by the mob before his eyes. This tragedy persuaded him to suggest yet more radical steps. It was clear to Windischgrätz that the existing Kaiser was simply not up to the challenges of the moment. Metternich had fled Vienna. But Vienna was not Berlin; Austria was no Prussia where the army could take over. It existed to serve the dynasty, not to replace it. ‘We need a Kaiser we can show the soldiers,’ Windischgrätz told his brother-in-law Prince Felix Schwarzenberg, nephew of the victor of Leipzig in 1813. The obvious candidate was the young Archduke Franz-Josef, barely turned 18 and known as the ‘Flower of the Habsburgs’. The boy was manly, a keen equestrian and a splendid-looking officer. But before the abdication of Ferdinand could even be thought of in practical terms, a number of Habsburg family members would need to be persuaded, and this would take time. The situation in Vienna certainly called for desperate measures. In October, the Imperial family had to move to Olmütz for the second time. The mob had stormed the Arsenal and, in an act worthy of the worst excesses of the French Revolution, had hacked the hapless Latour to death, stringing up his body from a nearby lamp-post, still alive. In March, Metternich, the erstwhile ‘Coachman of Europe’ had already made his discreet exit from Vienna and politics hidden in a laundry basket. Meanwhile the Hungarian rebellion was in full cry. The Hungarians wanted a constitution and demanded that all Habsburg troops stationed on Hungarian territory should swear allegiance to the Constitution rather than the Habsburg monarch. To make matters even more complex, the Hungarian troops were scattered throughout the realm. Of the twelve Hussar regiments only six were on Hungarian soil. Many were with Radetzky, and the last thing he needed was their marching off to defend their constitution. While he permitted some Hussar officers to return, the majority of the troops opted to remain. His troops, including several regiments made up of Italians, were loyal. Determined to seize the opportunity presented by the rather indifferent quality of the Piedmontese troops ranged against him, Radetzky was thunderstruck by a request from Ferdinand, now in Innsbruck, to make peace with the Italians. 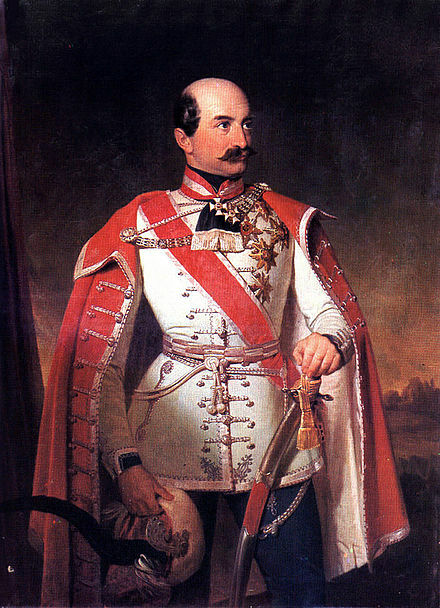 Radetzky urged the young Prince Schwarzenberg to travel to the Imperial court immediately to have the decision rescinded. Radetzky had often contemplated the action he now faced and had made the following manoeuvre the basis of many earlier exercises. As he recalled: ‘An enemy army from the west pursues a much weaker Austrian Army across the Mincio and occupies the heights of Sommacampagna but the Austrian army retires on Verona and there reinforced resumes the offensive.’ This plan became reality for Radetzky. On 28 April, 30,000 Piedmontese troops attacked 6,000 Austrians at Pastrengo and were swiftly beaten back in a short, sharp and defensive action, which would set the trend for the following weeks. On 6 May the Piedmontese attacked again with a numerical superiority of 3:1 at Santa Lucia where the 10th Jaeger battalion under Colonel Karl von Kopal, together with a battalion of the Erzherzog Sigismund infantry regiment, mostly made up of Italians, took up a strong defensive position. Two companies of the Jaeger defended the cemetery, where the fighting raged for hours. The two battalions held off and defeated three Piedmontese brigades in an action which showed that, in the hands of the right officers, Italian troops loyal to the Habsburgs were a formidable instrument against their confrères. However, it did not all go Radetzky’s way. Three weeks later the Austrian Tuscan division was defeated at Curtatone, and Peschiera, still weakly held, fell to the Piedmontese.